Keen Sense of Smell. The stone troll has advantage on Wisdom (Perception) checks where scent is concerned. Sun Allergy. While direct sunlight shines on a troll it must make a DC 15 Constitution saving throw at the beginning of each round; on a failed save the troll is paralyzed, and becomes petrified at the beginning of the next round. Greatclub.Melee Weapon Attack: +8 to hit, reach 10 ft., one target, heavy, large. Hit: 10 (1d8 + 5) bludgeoning damage. Crushing Grasp.Grapple Attack: +8 vs targets' Strength (Athletics) or Dexterity (Acrobatics), reach 5 ft., one creature. Hit: creature is grappled, and takes 8 (1d6+5) bludgeoning damage for each round it remains in the troll's grasp. Tough Hide. When an attack against a cave troll with a slashing or piercing weapon fails, the weapon is damaged and has a -1 penalty to damage rolls. This effect may stack. Sun Allergy. While direct sunlight shines on a troll it must make a DC 15 Constitution saving throw each round; on a failed save the troll is paralyzed, and becomes petrified at the beginning of the next round. Great Warhammer.Melee Weapon Attack: +10 to hit, reach 10 ft., one target, heavy, large. Hit: 10 (1d10 + 6) bludgeoning damage. Massive Shove.Grappling Attack: +10 vs creatures' Strength (Athletics) or Dexterity (Acrobatics), reach 10 ft., two adjacent creatures. Hit: creature knocked prone, pushed back 10 feet, and takes 12 (2d6 + 6) bludgeoning damage. Crashing Charge. 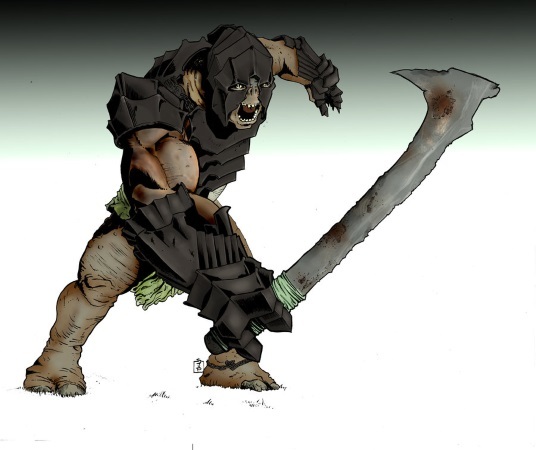 If the troll moves at least 30 feet straight toward up to 3 creatures right before hitting one of them with any melee attack, all creatures must succeed on a DC 15 Strength saving throw or be knocked prone, pushed back 20 feet, and take 2d6 bludgeoning damage. Greatmaul.Melee Weapon Attack: +9 to hit, reach 10 ft., one target, heavy, large. Hit: 13 (2d8 + 5) bludgeoning damage. Savage Roar (Recharge 5-6). Range 50 ft. cone, 5 nearest enemy creatures, creatures make DC 16 Wisdom saving throw, on failed save creature is stunned for rest of round and frightened for 1d4 rounds.